Ahw! I love the vest but steeking sounds scary! Good Luck! I must learn colourwork. I WILL learn colourwork! Except, I probably won’t. It looks like it requires effort. It’s really coming along! It looks great too! You’ll have to give me the full report on how picking up for the neck and armholes goes. This is the home stretch! Awesome. Can’t wait to see the next steps! Wow, that is absolutely beautiful. I think I need one of those. beautiful! i so have to do something with steeks soon!!!!! You clever girl! It’s looking amazing! I want that vest to be a stained glass window. It’s stunning! Good luck with the steekiness. How have you had time to get anything else done?! You do realize that you’re my hero…. right? seriously, cupcakes, steeks… oh yeah. It looks so pretty! Can’t wait to see it all done. Go for it! 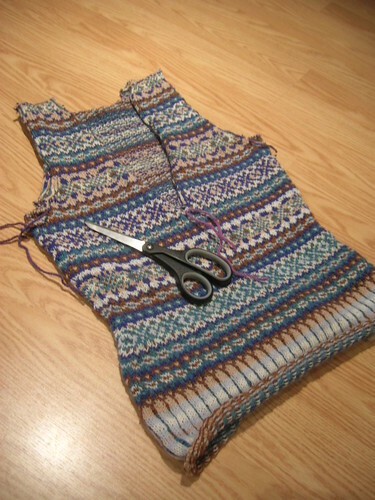 That is a beautiful vest, and you knitted it so quickly! Can’t wait to see it steeked and done. Squeee!!!! So gorgeous! Can’t wait to see it finished! I really have to steek something this year. That should have been on my list of resolutions. I can’t wait to see this finished. That is beautiful – the colours look amazing! I actually got goosebumps reading that sentence. 😛 But wow, it looks stunning! That vest is gorgeous, and I know it must be steeked. But I have to say that, for me, even having scissors in the same room as all that lovely colourwork stitchery would cause me to grab the garment and run screaming for the hills. I would require a preliminary dose of something truly obliviating before I could even let it happen, let alone do it myself. Like a 5th of Glenlivett, or half a dozen Ativan. Or maybe both.